One way, among others, to view the world is to oppose culture and nature. But in a territory such as the Écrins national park, there are as many ways to cultivate nature as there are ways to experience the mountains. To date, the social landscape is still largely unexplored. 40 years and already a century old ! 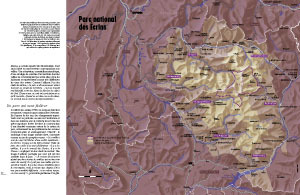 One century ago, the Bérarde national park was founded in the upper Vénéon valley. A remarkable, but premature, undertaking. That is why the current Écrins park, launched in 1973 as the fifth national park in France, can boast origins going back much further than the other parks. Here the story of a long, very instructive process. 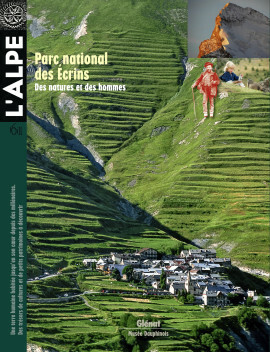 The challenge of the Écrins national park was to forge a shared identity among seven valleys, each with their distinctive character. Using the concept of a « massif » to join these disparate parts, the park invented a new territory. Not without tensions concerning major issues. Just what is the character of the Écrins national park ? A collective exhibition put together by over 150 persons provides a few answers. Whether up front or through the back door, in clear text or in precisely what was not said, all the answers emphasised the utmost importance of a participative approach to collective progress. A nuanced interpretation. Four interpretations of the park, a novel yet perceptive approach for this portfolio. Bertrand Bodin, Gérald de Viviès, Pierre Masclaux and Vincent Verrier all live in the park are deeply attached to the people and landscapes, in some cases for years. All the best addresses to discover the cultural side of the park. Not really, according to archaeologists who have discovered numerous traces of human activities throughout the Écrins national park, even up to 2 600 metres altitude and dating back 15 000 years ! Tough times for Alpine shepherds. Over the past century, pastoral civilisation has faded into the distant past. And over the past 40 years, the life of shepherds has continued to change, in step with the powers that be, the issues… and the studies of anthropologists. A sign of that is the collective study launched by the Écrins national park on « Sentinel high pastures », dialogue zones for the participants in pastoralism. Is the « boiled bread » from Villar-d’Arène a cultural heritage ? Should it be included in the list of local specialties ? Or, as ethnologist Marcel Maget would suggest, should it be seen above all as a social phenomenon ? The mountain refuges in the Écrins national park are not so isolated that modern conveniences have not found their way to high altitudes. Wider publics, environmental constraints, safety regulations and a desire for greater comfort have radically modified what were formerly rugged huts. A change that has not (yet?) overly transformed the ambiance. The higher altitudes are one of the last natural zones that humans do not permanently occupy. For many people, mountain tops are strictly mineral and absent of life. However, plants are present up to 4 000 metres and their extraordinary biological capabilities merit our attention. In the Champsaur region, Michael Dian launched in 1997 a festival to bring together live music and inhabited landscapes. Here, he expresses his love for the region and his opinion in favour of a form of cultural decentralisation that made the festival a possibility on the southern edges of the Écrins national park. The range has long been inhabited by a spirit of revolt. The area, the site of unusual mountain experiments where the counter-culture is at home, has seen some very innovative results. It acts as a magnet to those in search of Utopia.